The new president of the Movement for the Survival of the Ogoni People (MOSOP) Fegalo Nsuke has rekindled hope for a free Ogoni in Nigeria. Nsuke in an address this morning to the Ogoni people said freedom for the Ogoni people in Nigeria must be pursued vigorously. The speech followed his assumption of office as the new MOSOP president at the expiration of the tenure of the previous executives yesterday December 31, 2018. In a new year message to the Ogoni people this morning, Nsuke said: "Today, the Ogoni struggle is reborn, our hope for a better tomorrow is rekindled and we must all be prepared and determined to change our history and let the Ogoni star shine" Nsuke told a massive crowd in Yeghe, Gokana local government area yesterday. "When in 1990, our progenitors launched the Ogoni struggle with the publication of the Ogoni Bill of Rights, it was a collective move to re-write our history and give us hope. Tonight, that hope is rekindled as we turn a new page and together decide to match on so we can win together" he said. implementation of the cleanup exercise amongst others. 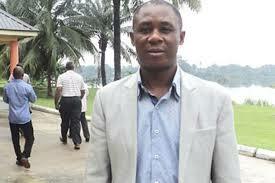 Nsuke said MOSOP will continue to challenge the discrimination against the Ogoni people in Nigeria. He said Ogoni generates 185000 barrels of oil daily and everything is shared by the rest of Nigeria and Ogoni gets nothing.That is the basis of our struggle, the reason we are aggrieved and we won't stop until our political rights to self determination is respected and freedom is won for our people. nationalities and nothing is left for us. Over $100billion dollars have been taken out of our land leaving us with a wreaked environment, poisoned and unable to support reasonable livelihoods. Currently, over 200 persons die weekly from the coastal communities alone and that is a sign that if nothing is done now, the entire Ogoni will eventually die. These are the reasons we have to stand to tell the Nigerian government we can no longer tolerate this injustices" Nsuke said yesterday.